The U.S. Labor Department released on Friday its July report showing that the American economy shed 247,000 jobs, the lowest monthly number since August 2008, and representing a continuing declining trend since the beginning of this year when job losses hit a record high 700,000 in January. To be sure, 247,000 jobs lost in one month is both staggering and sobering and an indication that the economy is still struggling. Yet when you measure it against 700,000, it's abundently clear that, like other leading economic indicators that have shown consistent improvement this year, the jobs market is nearing a bottom and according to most economists will likely begin to recover sometime next year. This is not only very good news for the economy and those looking for work, it's a feather in President Barack Obama's cap and a sign that his administration's stimulus plan is indeed working. 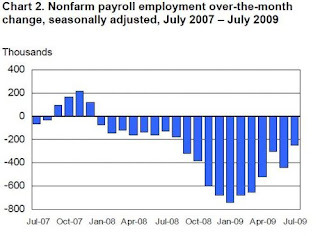 But do you think Republicans are giving the president any credit for this marked improvement in the economy? Fat chance. Typical of conservatives' reactions to the steady stream of positive news has been radio host Bill Bennett, who said on his program earlier this week: "Yes, the economy is beginning to turn around, but the stimulus package is not why." Now we all know that Republicans would be screaming for Obama's head if at this point in time the economy had continued to slide deeper into recession; if the GDP continued to appreciably contract, if job losses mounted, if GM went under, if the housing market worsened, etc. Simply put, they so desperately want to claim failure for Obama and his stimulus plan, and no matter how positive things turn, or how bright the future outlook becomes, they will never credit him for reviving this abysmal economy that George W. Bush created during his miserably-failed eight-year administration. But in 2010 and 2012, voters will, and that's all that matters. 1. Any comments that begin with something like..."Ostroy you're an a-hole"....will be rejected. If I came into your home and in the first 2 seconds started attacking you, you'd throw me out too. This is my online home. 2. Any posts that end with "I'm sure you won't post this"....will definitely get rejected. Don't challenge me. I also like to accomodate people's wishes. Ask to be rejected, and you will be. 3. Any posts with vile, nasty cursing out of anyone will be rejected. Save those for Hannity and Limbaugh's sites. 4. Anything even remotely racist, anti-Semetic, homophobic, sexist, xenophobic etc will be rejected. See above. 5. Off topic posts will be rejected. This is my blog. I get to decide what the topics are. You should also know that I have an intern who moderates the comments section. She knows the rules, and does the rejecting. So, if you don't follow the above rules, she zaps you and neither I or anyone else will ever read your stuff. This bunch of un-American fascists, collectively known as the Repuglicon Party, should renounce their citizenship and make their way to a land ruled by someone who is more to their liking. They are without conscience, and like an headless chicken they continue to show signs of life but are indeed dead. Never in my wildest dreams would I think the Republicans could actually say something positive about our President. They are rooting so loudly for him to fail and with him his policies and the rest of what's left of our country after their disasterous riegn of terror. According to them only Republicans cans keep us safe and only they can save the country. There's only one thing, If they have all the real answers on how to solve our monsterous problems, what the heck are they waiting for? If they know how to fix things, why haven't they done anything to make things better. Or better yet, if they know how to solve the problems, why did they allow this to happen in the first place? They must really believe that we are all as stupid as they are. Mr Ostroy, Not sure of late if you still allow posts which express an opinion different from yours. Thank you for your answer. I should know better being the polical junkie I am, but I am shocked at the level of racist hate and untruths being thrown out by the Republicans. It only confirms for me who they really are, but I hope we can keep the support of the majority of people. I can't imagine what will happen if the Republicans get the majority any time soon. I do have one question though: Why do we only see white folks protesting? I am white and am embarrassed at the untruths they yell. Sorry, ANON 7:17, but if you scan down to my "economic recovery" piece, for example, and more than half the comments quite forcefully disagree with me. No one who simply disagrees with me gets rejected. See rules above for how to post comments and what not to say/do. Play by those rules and you're fine...whether you disagree with me or not.